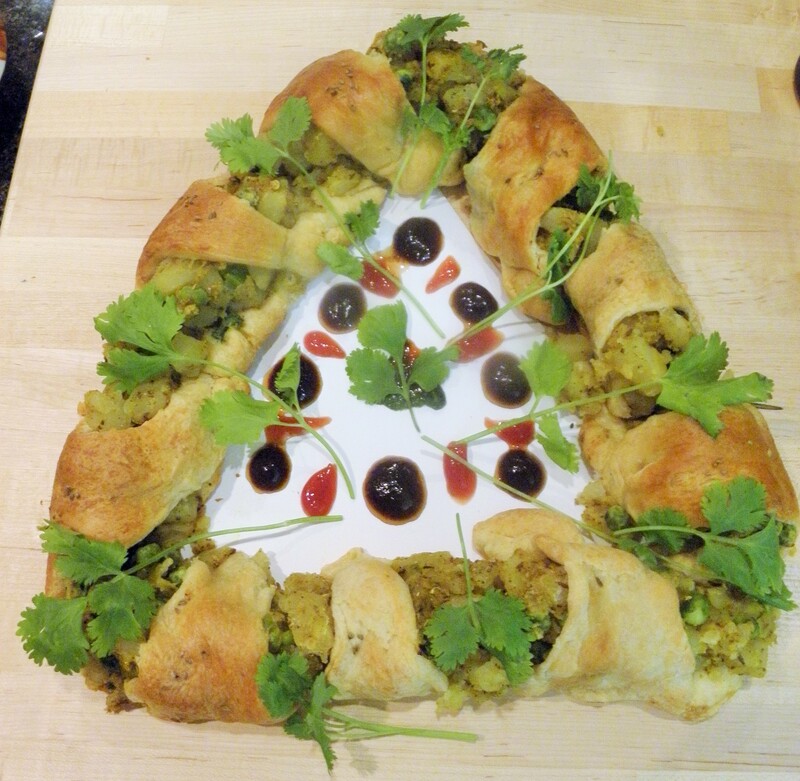 Samosa Triangle for the weekend party! The triangular samosas are a favorite snack of so many of my friends and family. So I thought why not make it easy by making it into one big triangle using Pillsbury crescent rolls? I was inspired after seeing the Pillsbury crescent roll wreath on their website. 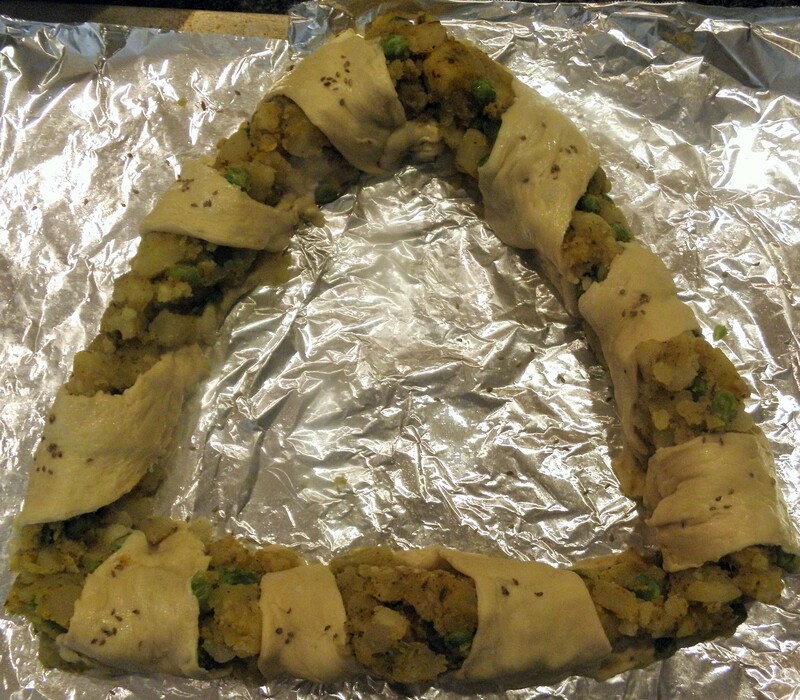 Of course, I wish my Samosa Triangle looked as perfect as their wreath did. I don’t know what it is, but I have always had the hardest time separating the dough into triangles:) In fact I had to roll out some again. May be that is why I ended up with 9 triangles instead of 8 like the package says! So your Samosa triangle will look much better than mine does. You could do 3 on each side and two for the base of the triangle. 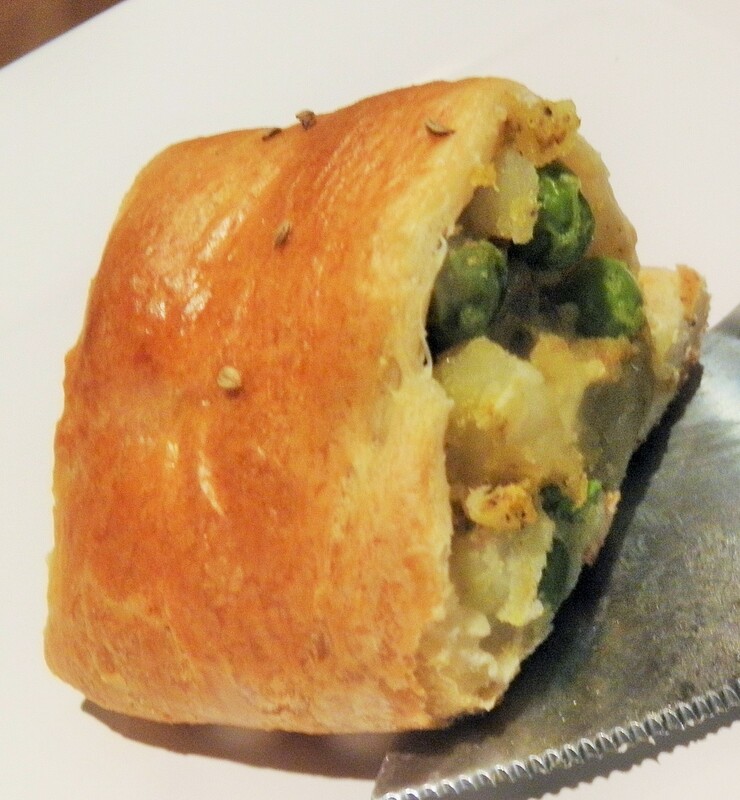 I like the taste of the perfectly spiced and crusty potato and peas that peek through the pastry while baking but if you don’t, you can use 2 packages of the crescent rolls and cover the triangle completely with pastry. 1/2 teaspoon grated or finely minced green chili. Do wear gloves when grating green chili. 2 large Russet baking potatoes, boiled, peeled and cut into about 1/2 inch dice. I add a touch of salt when boiling the potatoes. I feel it brings out their flavor. Heat the oil in a pan, over medium heat. Turn the heat to low and add the anise seed and cumin seed and stir for a few seconds until they release their fragrance. Add the green peas ( I add a tiny pinch of sea salt at this point too)and stir them for 2 to 3 minutes. Add the grated ginger and chili. Stir for a minute and add the turmeric powder. Stir it in the mixture for another minute. Add the diced potatoes, coriander powder, amchur powder and sea salt to taste. 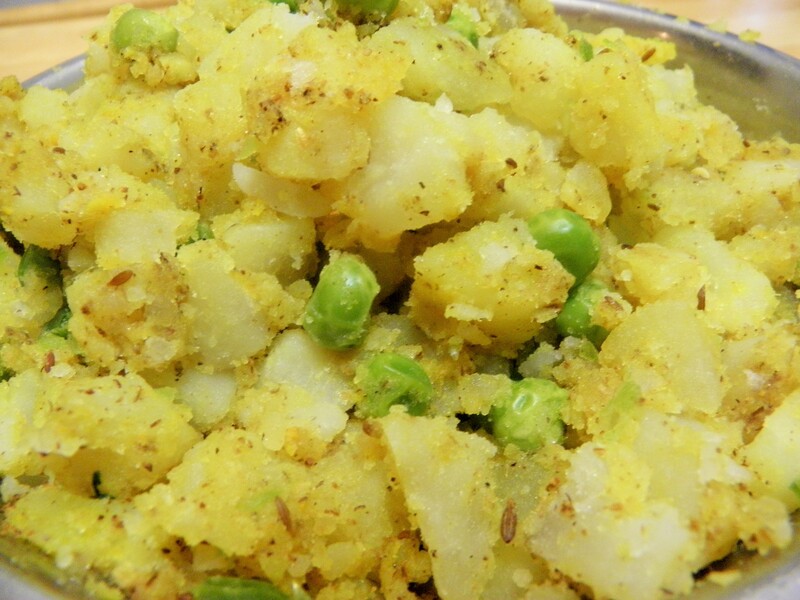 Toss well to coat the potatoes and peas with the seasonings and spices. Remove from heat and let cool. Defrost the Pillsbury Crescent rolls according to package directions. I lined my baking sheet with aluminum foil and lightly greased it with olive oil spray. In hindsight, I would bake it in an oven proof platter so I can serve it fresh out of the oven! 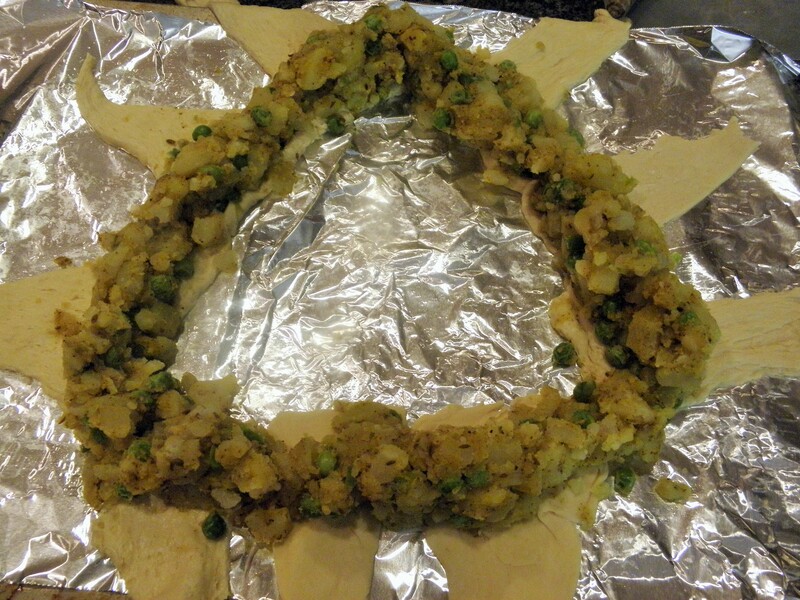 Crescent roll triangles with bases touching and the potatoes and peas filling. 5. Bake in the preheated oven for 20 to 25 minutes or until the pastry is cooked and golden brown. Serve with the green and sweet chutneys and/or ketchup! Yummy Samosa triangle is ready to be devoured! I like samosa. We can eat it at Indian restaurants here. Thanks Vidya! I love samosas too! The seasoning and flavors you have combined here are incredible! This is the perfect party fare this holiday season! This is a really clever take on the crescent roll ring. I’m sure this is the first time I’ve seen one made with Indian flavors and now I want a big piece! Thank you Lydia! It really tastes great and is easy to serve too. So glad you liked it. Thanks so much! So glad you like it. Such a great party appetizer! How fun! So true! i struggle with them every time! I love samosa’s, what a great idea to put it in a triangle! Thank you Sara! It is easy to serve this at parties too. I can hardly imagine how good this samosa must be…. wowwwww! What a really brilliant idea. Can I borrow it? Sure! Do post a picture of your samosa triangle! This recipe is so fun and festive! Love it! Jessica, I am so glad I discovered your awesome blog! Oh Sandhya this has my mouth watering and it is only 9am! This looks like a perfect vegetarian dinner, I absolutely can’t wait to try it. Thank you so much Lesley! Do let me know how you like it!